We shall cross paths I’m sure ! 5.8km in the pouring rain, legs heavy, but glad to of done something. Ashridge Sprint Duathlon today. 5k first run, just 2.5k second one. The big advantage of being old is that I won my age group, and that means I have already qualified for the world championships in 2020. Though representing GBR at Europeans in June this year first. I understand time issues but would add that for the first time in my life (and I ran to a decent standard in my youth) having built in regular gym sessions I can run 3 times a week. Bah ! & double bah ! Cracking effort, well done bud. Just wondered chaps, I purchased Mrs P a Garmin FR30 which talks to the Garmin App fine but I cannot get it to link with her Strava. 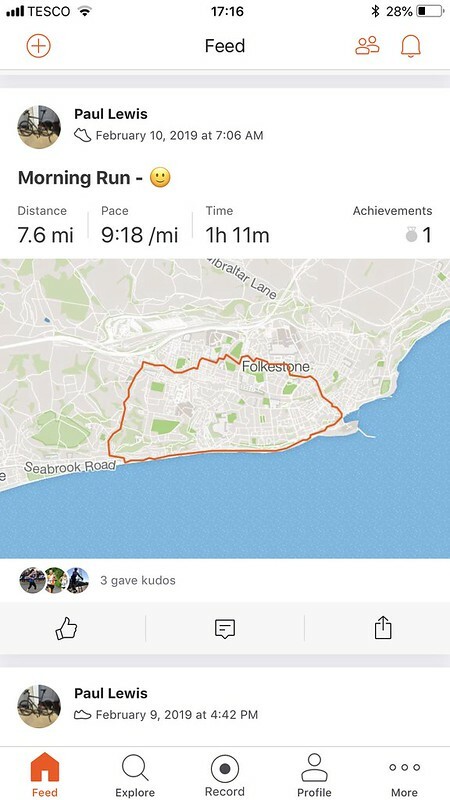 I have linked them and they say they are linked but the runs are not copying over to the Strava App. I had the same issue a while back. Un-linking an re-linking seemed to sort it for me. If the files are showing up on your Garmin app then its certainly the link between that and Strava. Make sure there are no blocks via the privacy settings in Strava / Garmin app. suspect getting anywhere near 20 mat be a struggle!! I spent a bit of time chasing the 20 min mark last year and ended up injured. Happy now just doing 24 ish every week and no stresses or strains. Cheers buddy and tried everything and no go. My Garmin Connect and Strava are working fine and we have mirrored the settings also. Minus 13 C for my 10km today (55 mins)…. My body feels like it’s been sunburnt! Was fabulous though…. Compacted snow was surprisingly grippy to run on! Great effort...I went out last night and struggled to do 4km! Miserable weather. Good stuff, 9.4k rattled out last night myself. Well went out and done 5.7km, was a real struggle to be honest, mentally not in it and legs heavy. Some good stuff here chaps and bloody well done. There is no doubt this really has given me the kick I needed and I am well and truly back enjoying a run again. Its good to see what you lot are up to and keep it up.. Managed a 3miler on lunch break yesterday nice and fresh out! 10.6km this morning, was a very cold day in the Highlands and the ground was really icy. Well done, I’m not risking it until the ground thaws. I can’t risk an injury when I’m only getting started. Enjoy the weekend runs chaps and stay safe! 6.4km this morning, beautiful day in the highlands but the pavements were really icy, don’t think the gritters had been out yet. If I’d known they were that bad I wouldn’t off went out to be honest. 60k last week, the final being a 25k on Sunday. Prep going ok for Ultra in 10 weeks. Need to shift a bit of weight and stop drinking though. Been following this thread. I'm just starting to pick up my running again after a good year in 2018; pretty much my first year properly trying to run. Always said (and was told) since a young age that I was a 'non-runner'. I was determined to give it a go in 2018 after a number of false starts (no pun intended). I managed to get my consistent pace down to under 8 minute miles and completed an organised 10km which was a big deal for me! To begin with I struggled to run a single mile without stopping. My target for 2019 is a half marathon, with a whole summer to build up to it. In the ballot for one I have in mind towards the end of the year, failing that I will keep looking. My main advice to newcomers would be that it will be very hard when you start. It will hurt. You will feel sick. For me it was vital to record my time and distance (Strava for me) as it allowed me to see progress and stay motivated. I was surprised to see how quickly progress came, though I admit the first month or so was hard work. Well worth it though, particularly once you realise that runner's high is a real thing! 2 runs this week so far, Weather not been great and felt pretty crap my self. Nowt wrong with those distances - keep it up! Bit of a struggle but got there in the end. First jog of the year done. Time to get back in to it! Starting to up my distance as the weather starts to improve. Got a 10km in this weekend. On longer runs (10km+) I am often struggling to 'get my head straight'. I am constantly thinking about distance covered, distance to go, how much longer, this hurts, that aches etc. When I break out of this I become quite clear of mind and actually enjoy the run. Does anybody have any advice for pro-actively this? PS. I received my place for the half marathon I was after in September! I run with music on all my long slow runs. Have my favourite albums on shuffle, so one great song after another. 16.1km so far this week, went out on Tuesday and had to stop and walk as I had a shooting pain right up my groin, out last night to try again and still pretty sore. Slacked off for the last month (combination of work travel, weather, a heavy cold a not inconsiderable dose of 'can't be arsed'), but just dragged myself out for a very sedate 5k. That's sedate in the sense of slow, it was still harder work than I'd like. Still, need to get back into it and there's really no alternative to putting shoes on and getting on with it! I know, I usually do, but we had 5 days in Stockholm in January and I didn't fancy the combination of very cold temperatures and snowy/icy streets. My shoes will be going off to NL with me this week for a run while I'm over. I had been wondering why your name wasn't coming upon Strava - now I know! Been having a very quiet week as doing a duathlon at Grafham Water tomorrow. Well eight weeks in, 26:17 for 5k and 58:58 for my first 10k yesterday in over two years, so pretty pleased at 53 the body is beginning to work again, the memory is there. I have also joined Waveney Valley AC so training once a week with them and twice from next week. So, the ole TZ club has got me going again. Great progress that! On the right path, just in time for the weather improving! You say the most loveliest things princess.